On the whole, the Techzilla S-Series should be considered a top end performance USA Bat in the Hybrid Drop 9 space. We aren’t the only ones to have information about the Techzilla S-Series. Other places, in particular those who sell bats, usually have a boiler plate write up on the specs of a bat. Many of those we reference to make sure we are seeing what we should be. Here are some more references for the 2018 Anderson Techzilla S-Series review. There are so few great options in the 2018 USA Bat space it is very easy to put the S-Series Techzilla on the short list of anyone. If you are a hitter that wants the power found in a true drop 9, want a great feel on hits and mishits, would like to try something off the beaten path then put the S-Series on your short list. If you also want an aluminum barrel have a mid $200 budget then might we suggest you just found your 2018 bat? Anderson is a proven bat company committed to delivering legitimate options to the space. And, who doesn’t want to try out the new Techzilla? The barrel profile is nothing to write home about. It measures under the average of the space. But, we think, barrel profile is way overrated anyways. As of this writing the bat is only available in a 30-inch. But, they expect that to change very shortly. Don’t be scared off by the drop 9 categorization. 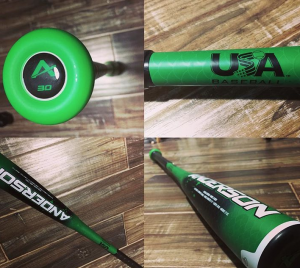 This bat swings lighter than a few drop 10’s in the 2018 USA space. The price point for a performance bat is reasonable although, we admit, we’d being falling over ourselves if it was more like $179. The feel on contact is not a smooth as a CF Zen, which we think leads the class, but is also more than $100 less expensive. (It does, mind you, have a better than average feel in the two piece USA Bat space). The most obvious similar bat to the S-Series USA Techzilla is Easton’s 2018 Beast X Hybrid. That Easton bat is considered by most the hottest bat on the USA Bat market. However, that bat also drives a high price AND is should be considered at least a drop 9 if not a drop 8. See our full 2018 Easton Beast X Hybrid USA Bat Review. Mizuno also makes a two piece hybrid bat called the Covert that is a drop 9. In terms of price and construction both the Covert and the S-Series are very similar. We like how both of them swing, prefer the feel on the S-Series more than the Covert but the Covert does have a bigger barrel profile. See our full 2018 Covert USA Bat Review. Although many have never heard of Anderson bats, they are a legit player in the space and have been for a long time. Those in the fastpitch market know they make a killer Rocketech that does fantastically in cold weather. They also once made a single piece aluminum youth bat that would singe the hair off your eyebrows. Different then other baseball Techzilla’s of year’s past, the 2018 S-Series USA Bat is a two piece hybrid bat. Meaning, the handle is made of composite and the barrel is aluminum. Our experience to date with USA Bats tends to lend preference towards two piece hybrid bats. We have seen younger players appreciate the smoother feel of a two piece bat and comment on the hot out of the wrapper performance of an alloy barrel. An aluminum barrel doesn’t require any break in and the lack of experience about USA Bat performance gives these barrels no questioning if they are ready to go (like it happens on composite). The drop 9 is simply an honest assessment of the barrels swing weight and actual weight. Other bats in the space, and we talk about this ad naseum elsewhere, rarely weigh what they say. In fact, based on actual weight, most drop 10 bats in the USA 2018 space should be drop 9s. The Techzilla weighs and swings no different then them but, instead, is simply stated as a correct drop 9. At release, the 2018 Techzilla S-Series comes in a 30/21. The expectation is to have a 31 and 32 inch by the end of the season. Barrel size, like all USA Bats, peak out at 2 5/8…compared, etc. Although categorized as an endloaded in most of the marketing literature we could find, the bat we actually think it fits right in the wheel house of most drop 9 hitters. The 30/21 has a swing weight only 5% heavier than the lightest swinging 30/20 drop 10 USA Bats. And, compared to some so called “drop 10’s” in the USA Space it actually swings lighter. (We measured its MOI around 5100 units on the 30/21. Compare that to the 31/21 Beast X Hybrid which we found to be 6800). Looks like the ball comes off pretty hot. be interested to see the exit speed.